In Quasqueton’s "Is Sunless Citadel a well-designed adventure module?" thread, I made a claim that the dungeon described in the module is too linear and that its layout is responsible for railroading player characters. Although I didn’t mention it, I have similar problems with Forge of Fury. 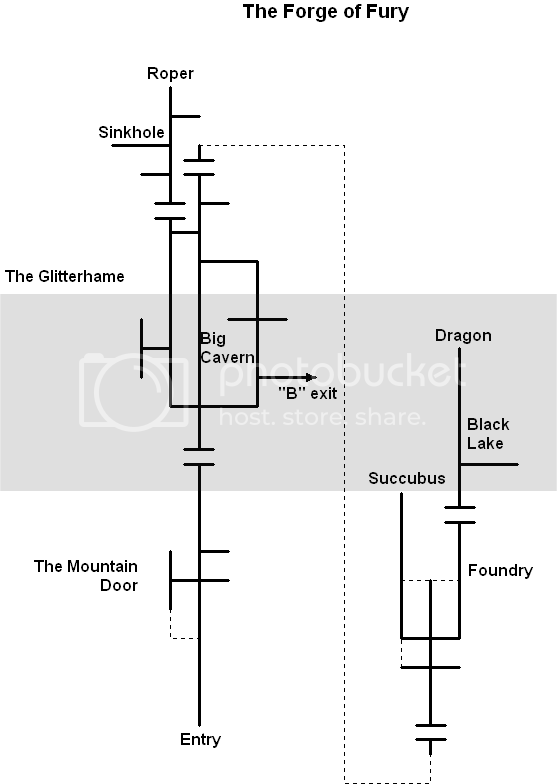 The significance of map design has already been discussed in an earlier thread („Would these maps make for a fun dungeon adventure”), where Quasqueton posted an example map and basically asked posters whether they thought it was well designed or not. I think there is no harm in revealing that the map in question depicted a level of Gary Gygax’s original Greyhawk Castle. In my opinion, designing a good dungeon also involves creating a good map. It must be stressed that this is obviously only half the battle - without imaginative content, all the effort is for naught; while a dungeon whose map is poorly designed may be saved by well thought out encounters. In this thread, I don’t wish to discuss the latter aspect, only mapping and how it can contribute to enjoyable play. What makes a map good or bad? Fundamentally, a good map should enhance the factors which make dungeon crawling enthralling: for instance, exploration, player decision making, uncovering hidden areas and secrets, as well as maintaining the pace of action. Exploration entails discovering previously unknown territory. To find a lower level, a section the PCs have never been to, or simply some entertaining and imaginative room, is one of the great joys of dungeoneering. However, for all this to feel like an accomplishment, there has to be a meaningful effort on the part of the players and a challenge on part of the DM. There can be no real exploration if the dungeon isn’t large enough or complex enough to allow failure, as in certain areas being missed. If encounters are presented one after another, there is no challenge and no accomplishment in this respect. Player decision making from the operative to the tactical and strategic level involves dealing with obstacles, negotiating hostile territory and ensuring the success of an entire expedition. Naturally, many individual decisions are based on a „golden rule” such as left-hand-on-the-wall or random chance, especially when there is no way of knowing what the decision „means”; that is, what its likely outcome in one case or the other may be. However, by making a dungeon where the players can choose to avoid or meet obstacles, take or avoid risks by visiting/not visiting „deeper levels”, explore side branches or concentrate on reaching an objective, etc., player decision making becomes a more interesting and meaningful challenge. Generally, branching, complex maps offer many possibilities for decision making, but overly complicated maps do not: they just cause frustration. Uncovering hidden areas or secrets is yet another form of reward for resourceful players. Finding a secret door leading to a room with treasure is fun; finding one leading to a hidden sublevel or a previously undiscovered section is even better. A good dungeon should have at least a few of these, preferably a good amount, and they should be found primarily due to player ingenuity. Judges Guild’s Caverns of Thracia is likely the best example of a dungeon with well designed secrets: entire levels and sub-levels may be uncovered by observation and resourcefulness. Finally, maintaining the pace of action is important to ensure the game remains exciting and doesn’t get bogged down for too long. Shoot-and-kill computer games usually call this „map flow”. In the end, a dungeon without any real branches would look like a straight line (A. ), or a straight line that looks slightly hairy (B.). The Slaver modules or Lost Tomb of Martek would fall into this category. Branching dungeons (C.) are a bundle of straight lines (often with sidetracks), sometimes resembling trees. 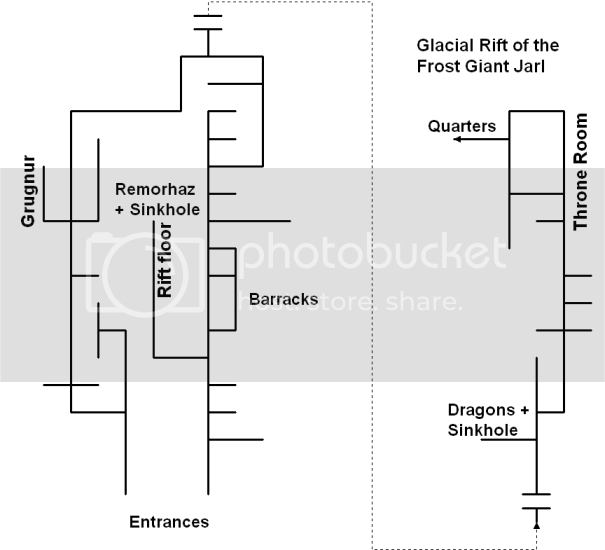 White Plume Mountain is a good example of a branching dungeon. Finally, dungeons with circular routes (D.) are the most complex, especially when these routes interlock and include the third dimension. Again, Paul Jaquays is the undisputed master of this area, with modules like Caverns of Thracia, Dark Tower and Realm of the Slime God. In my opinion, including the second two forms without being overwhelming makes a dungeon map much better than a straight affair. Let us now look at the modules. I selected six modules aimed at beginners for my analysis and supplemented them with two for high levels (these were included for comparative purposes also). Of the eight, four modules were written by Gary Gygax, which could have skewed the sample a bit. Then again, the aim wasn’t strict „science”, just a fun comparison. On these maps, dashed lines represent secret passages/connections and broken lines represent „level transitions”. Sunless Citadel’s layout is the perfect example of an almost completely linear dungeon. 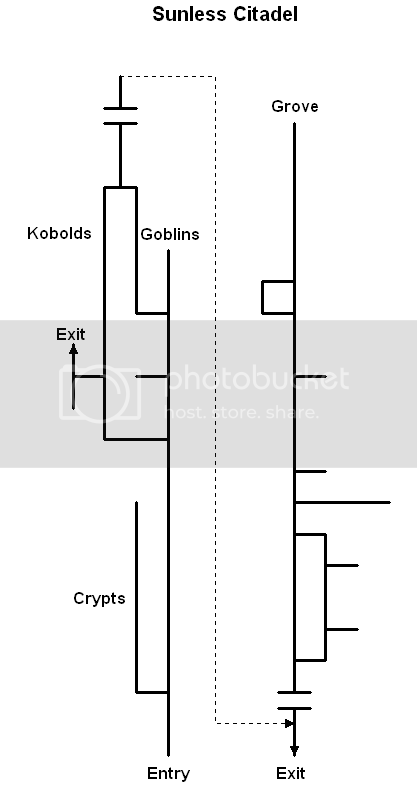 This isn’t apparent on first sight, because Bruce Cordell introduced a lot of twists to the corridors so they would look more organic, but in the end, it is still a straight line with the „choice” of either going through the kobolds or goblins, woo hoo. Sunless Citadel is, all claims to the contrary, not a classic dungeon: it is designed to be a story, and it plays like a story. Unfortunately, player choice isn’t high in it outside combat tactics... which, granted, are fun. But a good map it is not. Our second module (author Richard Baker) is more promising on first sight, but eventually reveals the same structure: straight line layout, definite beginning and definite end in the form of a boss monster. Little player choice. The only thing that makes Forge’s maps better designed is the presence of optional detours. It is interesting to see the thought process behind them: the big detours lead to „mini-bosses”, a roper and a succubus, respectively. 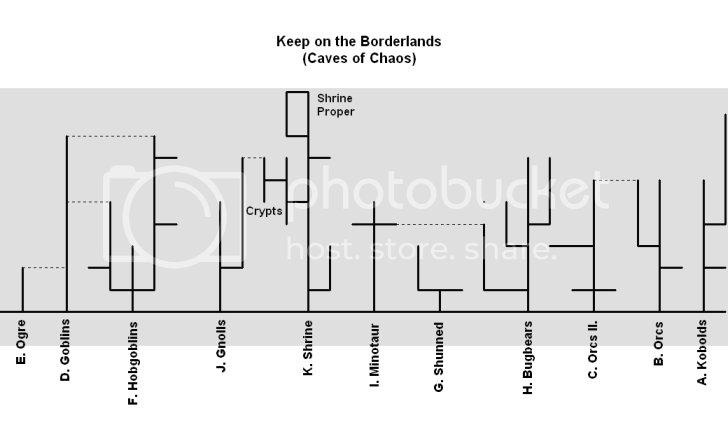 Let us compare the previous modules with the classic Keep on the Borderlands by Gary Gygax. I will omit the keep and wilderness (which introduce some really entertaining possibilities, greatly enhancing the game experience - these elements are regrettably absent in Forge and Sunless) and focus on the Caves of Chaos instead. The layout of this dungeon area is completely different from the aforementioned. The individual monster lairs follow the „straight line” or „branching” structure, but the number of these lairs and the occasional secret connection make adventuring in this environment rewarding indeed. All of the lairs may be entered at will (the long horizontal line on the image represents the ravine). The dungeon is thus both complex and compartmental - with enough room for exploration, but probably not overwhelming if the lairs are tackled individually. Mike Carr’s In Search of the Unknown has the most complex dungeon layout in our sample. 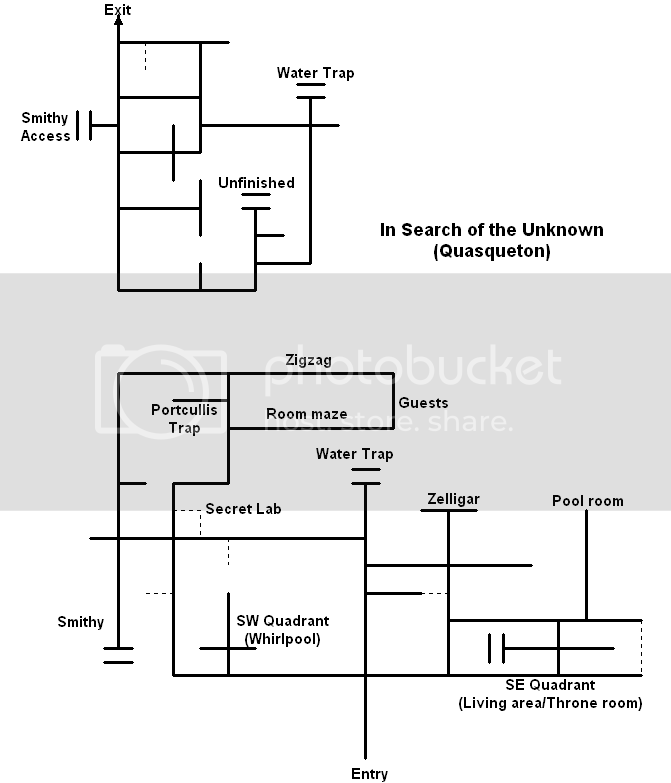 I would argue that the main draw of the module is precisely this - it presents a lot of classic dungeon exploration challenges like room mazes, secret doors, twisting corridors and such. What makes it even better in my opinion is that it does this without being frustrating, but also because the macrostructure beyond the basic elements is so good. You can explore this dungeon and really find things. Unfortunately, the entire dungeon couldn’t be represented as a single network (the lower level would have made it very convoluted for the observer), but I hope my point was made. B1 harkens back to Original D&D design principles and it shows. I freely admit that I dislike this module, and my analysis may be coloured by bias. However, looking at the layout of this dungeon, one of my complaints about it is reaffirmed - this is an early example of the linear adventure. You can even identify the boss monster (and the crayfish miniboss, of course, who is cooler than the boss himself). 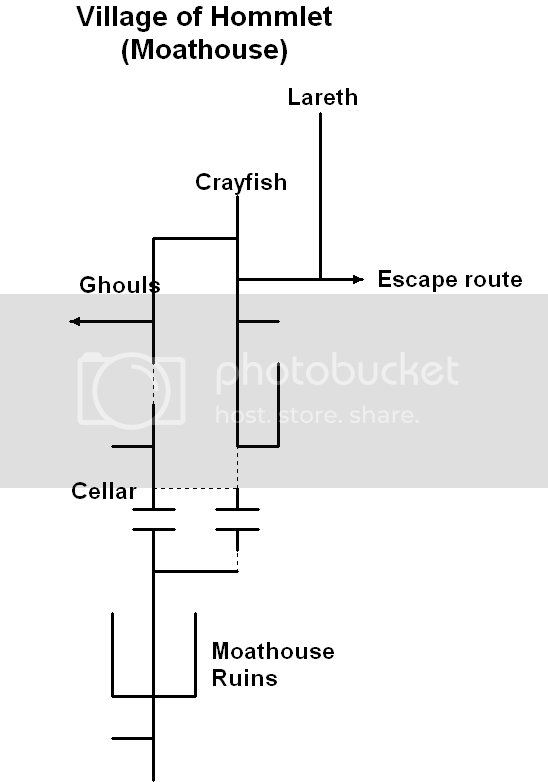 The moathouse dungeon has two redeeming features (not enough to be cool in my eyes, though): one, hiding the entire „inner dungeon” by two secret doors is a good idea - it forces the players to be alert and attentive, even resourceful. Second, it is a very small dungeon, where it is hard to really shine in mapping. Granted, this is because Gygax wasted too much space on Lameburg and its entirely mundane and boring residents, but hey. 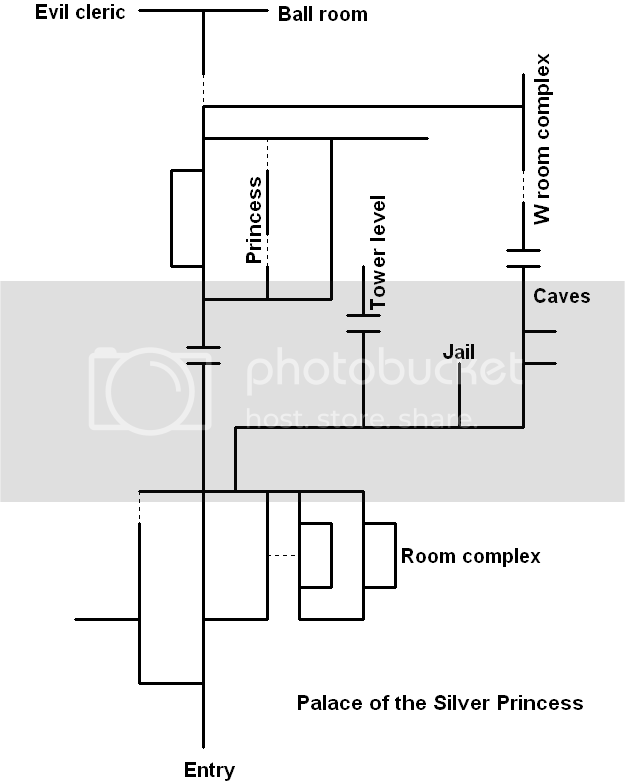 Palace of the Silver Princess is not usually considered a good module, but I actually think it is better than its reputation (the orange one, at least): a straightforward dungeon bash with a lot of unexplained stuff (a good point), a lot of magic and secret to boot. It also has a very good map. I really like the multiple nested circular routes on the lower level, and also the fact that the module has two „conclusions” - one of them is finding and killing the evil cleric, and the other is finding the hidden room of the princess and her lover (who are accursed ghosts - a nice twist on the cheesy „save the princess” cliché). However, most parties would only find the former! That’s great. I wish more modules had that secrets within secrets and mysteries within mysteries element. This module wasn’t an introductory product like the others, but it was among the first modules TSR published. I included it because of its tournament design: it has some flaws similar to Sunless Citadel and Forge of Fury, in that it is once again too restrictive in some respects... on the other hand, there are so many well designed side areas, especially on the higher level, that this isn’t so bothersome in play. G2 (and Tomb of Horrors, which I didn’t have at hand) demonstrate that the linear structure can work - if balanced by good content (conversely, In Search of the Unknown is only „good” instead of „great” because most rooms just aren’t that great). I will not discuss the underworld section of this module, because it falls into the domain of wilderness adventuring, and will instead focus on the set-piece: the troglodyte/drow warren. Similar to Keep on the Borderlands, this dungeon is greatly helped by an open central area from which „branches” can be accessed. The great cavern links individual monster lairs, some of which are nasty and some of which are very, very nasty. As we can see, the western half has more individual lairs (usually with more dangerous denizens), the eastern half is more „mazy”, and here the challenge is in overwhelming numbers and using the terrain layout to advantage. I hope that these brief demonstrations helped underscore the gist of my argument: good map design contributes to the fun of an adventure, and it is not a total crapshoot - there are clearly identifiable design principles which (admittedly from a gamist/”old school” standpoint), when followed, benefit a given creation. Sunless Citadel and Forge of Fury aren’t flawed adventures because they are new, but because they employ a structure which is antithetical to freeform play and represents a more rigid „story-game” approach, something D&D should be rid of. Likewise, many (although not all) old adventures are good because they do these things right, not because of the tired and fallacious „rose coloured glasses” argument. There is nothing preventing modern designers (or just garden variety DMs) from learning these tricks and using them towards their own ends. It also has to be reiterated (because it needs repeating) that maps aren’t all. They can’t make a module good solely on their own. But I think we can accept that they can help a module be better, and that goal should not be underestimated. That is a wonderful bit of work, Melan! I tend to like less-linear dungeons better than more-linear ones, but the more-linear can work. If all the dungeons in a campaign are more-linear, that can be bad. Does designing a good dungeon involve designing a good map? No. In fact, it involves designing a crappy map. And I'll tell you why. You've clearly spent a bit of time making those charts. But they're fairly usless as far a gauging the adventure goes. You've eliminated the crooked hallways, the superfluous twists and turns all thats left are basically straight lines connecting the encounters. But the encounters themselves are not indicated, except in the broadest strokes. And it's the encounters, not the hallways, that make or break the dungeon. There's a saying that my parents are fond of: "Getting there is half the fun"
That saying is a lie. Getting there is Boring and Painful. Being there is fun. Any fun trip is a series of 'being there's The fun isn't in getting to getting to San Francisco from La. The fun is in being in Santa Barbara to visit your old college roommate. The fun is in being at Solvang, buying their touristy things. The fun is in being at Pismo Beach, Enjoying the waves. The fun is in being at Hearst Castle, enjoying the art and history. Or, sometimes not. Solvang isn't for everyone. But it's the beings that define the trip for better or worse. The gettings just get in the way. And adventure maps, no matter how carefully planned out are all getting. The being is in the encounters. Mazes of twisty passages, all alike? They're getting in the way of the interesting stuff. And the more complex the maze? the less fun it is. Things are in the adventure so that the players can encounter them and interact with them. Nobody wants to pay good money for an adventure module and then not get to use half of it because the players took the left fork first. A simple "Point A to Point B" structure is the simplest and most efficient way of giving people a chance to experience the full breadth of the adventure. Saying "In order to reach your destination, you have to get past the Dragon" isnt' railroading. Railroading is saying "In order to get past the dragon, you must fight her with the obsidian weapons you found in room 3". It's not about the players making choices--It's about the players making meaningful choices. Deciding whether to fight the dragon, to bargain with her, or to sneak past her is a meaningful choice. Deciding whether to go left or to go right is a waste of everybody's time. The analysis here is very good, and is the sort of thing that designers should consider. We see this, at varying levels, in things like the Design and Development articles. I, for one, found that all my players loved Forge of Fury (we didn't play Sunless Citadel). Sure, it's linear. But they didn't mind a linear adventure. I made some substantive changes to the module, but I didn't change the dungeon, and I left the vast majority of the critters alone. Also, I find that complex dungeons, ones with mazes for instance, just plain bother most of my players. It's not that they don't like choice--Keep on the Borderlands was brilliant fun then, and it would be brilliant fun now. But, dungeon design is just a part of adventure design, I think, and anyone (mis? )reading Melan's article here might be persuaded that linear dungeons cannot be good adventures. I pretty much agree with arscott and Vrecknidj. What if I designed a really awesome, multi-dimensional dungeon map with lots of ways the players could go, and then instead of making a key of encounters, I just sat down and made a list of all the fun and important encounters that the PCs should experience before they got to the end? Then no matter which way the players went, they would still end up fighting the kobold sentries, solving the riddle of the magic pool, talking to the prisoners who give the PCs clues about the BBEG, finding the secret door, killing the guardian of the helm of brilliance, and then using it against the half-dragon lich in the final encounter. Now this might sound like railroading, but it results in a cool adventure. Much more fun than if the players completely bypass the clues, miss the helm, and become lich-food. So I think one reason some published modules tend to be linear (with or without dungeons) is that the story makes more sense or is more enjoyable when one encounter sets up (or in some way prepares for) the next. Just as in fiction, every scene should have a purpose. IMHO. An interesting dissection of scenario maps. Good show, and thought provoking. That's a fascinating essay - and a very good way to look at an adventure's flow. I'll point out that I love linear dungeons, as long as they make sense logically. If I put in branching, it definitely tends to be the "loop around" type so that I can have a linear beginning and ending with a lot of choice in the middle. Last edited by Piratecat; Saturday, 15th July, 2006 at 02:06 PM. Nice. I like the analysis, but in my case, I'd add a caveat - I don't always want my dungeons to be of the large non-linear sort. Oftentimes, that doesn't make a whole lot of sense for the background of the adventure. I tend to add my non-linearity outside of undeground complexes and then build the "dungeon" according to the needs of the denizens, and if non-linearity results from those needs then great. So I wouldn't say that linear design makes a dungeon inherently bad, but rather I'd say that nothing but linear design makes a campaign less than it could be. I'm not generally a person who is really into big dungeons, although I try to include one or two in every campaign. And when I work on the next ones, I'm going to keep your analysis in mind - especially the insights regarding hidden sub-levels and undiscovered sections being rewards for careful and insightful players. Sometimes, a "simple" layout is just what you need as part of a more complex storyline (a web of inter-related NPCs or whathaveyou). Complex isn't always good -- from the player's side, even a little complexity can be enough to add the right level of mental challenge to the game, and what seems straightforward to the DM can seem strange and mysterious to the player. Those illustrations are great. They could just as easily become flow-charts for urban/political adventuring. I happen to like choke-points in adventures -- and then sections that are more free-flowing -- and then another choke-point, and so on. I guess the pattern might be -- line --> loop --> line etc. As you say, it is fun to discover a secret that can turn a "branch" into part of a "loop." Sometimes part of a loop will be hard to navigate by typical medium-sized terrestrial humanoids (gorges/ravines, underground rivers, small tunnels for rats, etc.). A good place for those who have focused on movement-related skills (climbing, swimming) and utility magic to shine. Last edited by EricNoah; Saturday, 15th July, 2006 at 02:23 PM. Firstly can I say that this was a great read and thank you Melan for all the obvious effort that went into your starting post. It's threads like this and poster's willing to give so much of their thought and time that makes ENWorld such a special place. For a lot of players this level of DM direction is a good thing. A lot of fun can be had purely by the great encounters planned and the non-stop action. However, there is one important ingredient that this approach is vacant of. Action and reaction. Without this, the depth of the game maintains a tepid consistency. In subtle ways, people wonder: what would have happened if their PCs had have zigged instead of zagged? Well, they would have gone up that tunnel and taken on the Sentries through the other door. Would this affect things much? Maybe but not really. It is more a cosmetic fascade for an encounter that was always going to happen. I believe the thing that can make a game special is when the DM alters the finish line, introduces another "player" in the game or reacts in some way to what the PCs are doing. Entire arcs may appear or disappear depending upon whether a PC forgets to write that letter, goes out of their way to make a snide remark to an NPC with a long memory or perhaps befriends someone for information rather than capturing them. These are the elements of a game which to me make it fun and more involving. I believe players talk about what their characters are going to do, much more so than what cool encounters they have endured. Now, what I believe Melan has successfully done is shown how this selfsame principle is embodied in the layout of "good" dungeons. It is certainly something I think worthy of further exploration. While it is generally far more practical to have linear elements in published adventures, perhaps some of the more complex elements have momentarily faded from the screen? Or perhaps these are the things good DMs will augment their adventures with anyway? Mimicking WotC's layout design, fonts, etc. . . Coupon Layout Design: what do you think?